OSCODA – Verdant on a late summer evening, Clark’s Marsh, an old bend in the Au Sable River, is a fine spot for a walk, and the river is a fine spot to hook a trout. That natural beauty drew Arnie Leriche to this place. When Leriche retired from the U.S. Environmental Protection Agency, he moved with his partner to Oscoda, the town just downstream from the marsh, with the idea that he would spend his work-free years fishing the clear waters of northern Michigan. 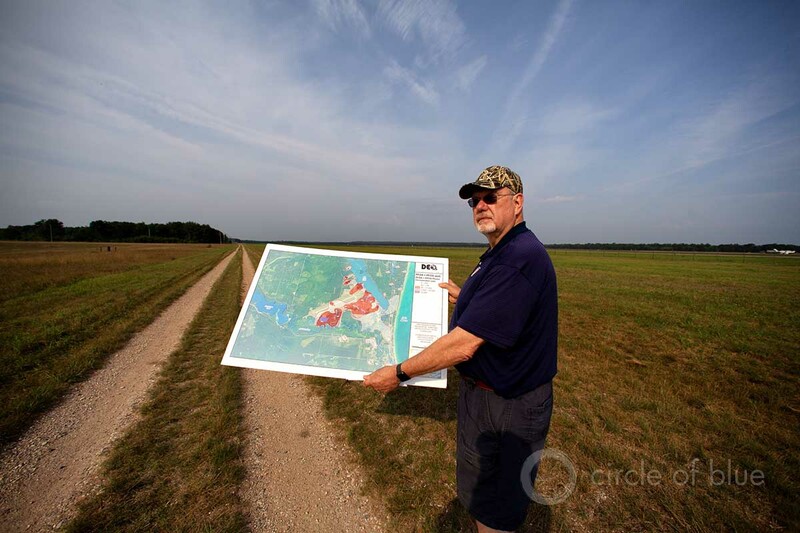 Trouble is, the marsh is just downstream from the former Wurtsmith Air Force Base, where toxic PFAS chemicals have been leaking into groundwater for decades from a field that was formerly used for firefighting training. The groundwater, tainted by foams used to put out the fires, seeped into the marsh, then into the river, and on down the watershed, even into Lake Huron. A few years ago, the Michigan Department of Community Health issued a warning to anglers: Do not eat the fish from the marsh. Leriche, knowing a bit about pollutants from his years at the EPA, began to worry. Tests showed chemical concentrations in pumpkinseed and bluegill fish to be more than 15 times higher than state standards. Michigan has 7,300 toxic sites. Money for cleanup is almost gone. Wurtsmith is one entry in a long and varied ledger of contaminated sites in Michigan that are contributing to a statewide groundwater emergency that has spilled over into rivers, streams and lakes. The extent of this contamination and the state’s failure to muster a response equal to the challenge is detailed in a report from FLOW (For the Love of Water), a Traverse City-based water advocacy group. Groundwater in Michigan, what FLOW is calling a sixth Great Lake, is “compromised and deteriorated,” the report asserts. The threats come from all angles: abandoned industrial sites, military bases, dry cleaning facilities, landfills, septic tanks, underground tanks that store petroleum fuels, and fertilizers spread on farm fields. The Michigan Department of Environmental Quality has identified more than 4,000 potential sites where contaminated groundwater and soil could release toxic vapors into buildings. Excessive groundwater pumping, in places like Ottawa County, has been found to worsen water quality because it pulls deeper, saltier water into wells. Michigan PFAS by the numbers: How much is unsafe? The report criticizes Michigan for inadequate funding and hands-off policies that for decades allowed pollutants to accumulate in groundwater reserves. Even today, nitrates continue to build up in shallow groundwater in agricultural regions. “Groundwater is treated as a place where wastes go, not a place to keep wastes out,” said Dave Dempsey, the report author. Why write the report now? The timing, Dempsey said. He noted the discoveries of PFAS chemicals in dozens of locations around the state, from Oscoda in the northeast to Parchment in the southwest, increased public awareness of groundwater, which, in turn, has put pressure on public officials to respond. Second, state elections are in November and a new administration will come to power next year. “It all adds up to a chance for a new governor to take action on one of our most important water issues,” said Dempsey, a senior adviser at FLOW and environmental adviser in the 1980s to former Gov. James Blanchard. The to-do list is long, as the FLOW report points out, citing state data. The Michigan Office of the Auditor General found in a March 2017 assessment that the Department of Environmental Quality (DEQ) lacks funds to clean up the 7,313 contaminated sites that affect water and soil. The $685 million Clean Michigan Initiative, a bond that voters approved in 1998 to fund the cleanups, ran out of money at the end of 2017. “Without additional funding, contaminated soil and water sites known to DEQ as posing a health risk to humans and the environment will go untreated,” the audit states. Securing a new funding source is one of outgoing Gov. Rick Snyder’s priorities for the last months of his term. Snyder has proposed an increase to the fee for dumping waste at a landfill, from $0.36 per ton to $4.44 per ton. The fee would generate an estimated $45 million a year for cleanups. Snyder has struggled over the past year to gain buy-in from Republican lawmakers, though the powerful Michigan Farm Bureau and Michigan Chamber of Commerce announced their support in late August. “It would be a welcomed step, if enacted,” Dempsey said, even though FLOW supports another bond measure instead. Still, the dollar amount is roughly equal to the $50 million a year that FLOW recommends in the report. Meanwhile, another Republican — Sen. Margaret O'Brien of Portage — proposed legislation this month to fund cleanups and other water infrastructure upgrades through a $2 billion bonding program. Some sites have been left to fester for decades. The state has put restrictions that prohibit the use of groundwater for drinking water on the deeds of 2,239 properties because of existing contamination. The scale of the problem can be staggering. In Mancelona, a plume of groundwater laced with trichloroethylene (TCE), a grease cleaner, has spread six miles from a former auto parts manufacturer that operated from 1947 to 1967. It is one of the nation’s largest TCE groundwater contamination sites. Wastewater from the facility was dumped in unlined pits, from which the chemicals percolated into groundwater. The DEQ, which is funding the cleanup because the companies went out of business, estimates that 13 trillion gallons of groundwater, down to depths of 500 feet, have been contaminated. The plume is moving northwestward at roughly 320 to 400 feet per year. The state paid to extend the public water supply system to 500 homes whose wells were tainted. “It’s always a challenge to have enough staff and resources to address the need,” said Andrew Hogarth, former chief of the DEQ remediation and redevelopment division. Hogarth retired nine years ago after managing contaminated site cleanups for the state. “I don’t think it’s gotten better,” he said about the lack of resources. These slow-moving, widespread contamination zones are a risk especially for the 2.6 million Michigan residents who rely on household wells for drinking water. Well water is unregulated, and it is the homeowner’s responsibility to ensure their water is safe to drink. Dempsey and FLOW recommend a state fund to assist private well owners with water testing, which can cost hundreds of dollars per sample for volatile organic chemicals like TCE. The report offers a number of other recommendations to protect groundwater: minimum statewide standards for septic systems, a long-term funding source for cleanups, regular reporting on the status of the state’s groundwater, and tighter control over when farmers can apply fertilizers. Above all, the report argues, Michigan should align its regulatory system with the laws of nature: by affirming in policy that groundwater and surface water are connected, part of one cycle. The linkage is ignored in practice in state policies and even in the federal Clean Water Act. But that is no excuse for Michigan to do the same, Dempsey says. What is swept underground often does not stay there. Like a river, groundwater moves – and carries pollutants with it. An estimated 42 percent of the water in the Great Lakes originates as groundwater. “Groundwater is treated like a second-class citizen because the connection to surface water is not seen,” Dempsey said. Those hydrologic connections are evident in Oscoda, where residents are furious that the state and the Air Force have not done more to halt the flow of PFAS coming from Wurtsmith. The base is “bleeding,” as residents are keen to say. And they want it stopped. “We're based on pure Michigan, right? That’s our motto,” says Cathy Wusterbarth, alluding to the state’s marketing slogan. Bridge Magazine teamed with Detroit Public Television and Circle of Blue, a Traverse City-based nonprofit, for this special report on the multiple threats to Michigan’s groundwater. Brett Walton is a correspondent for Circle of Blue. The reporting partners will host a live broadcast to discuss the report and similar threats worldwide at 1 p.m. Oct. 1. To register, follow this link. The issue of our drinking water contamination demands immediate action not a forever delayed one or an ineffective one. One of the many issues that can be immediately addressed is the deep well pumping by the water bottling companies which is pulling up salinity to permeate shallower ground water deposits which are important to land owners or farms for human consumption or farming watering needs. First in this issue is the amount they pay the state to take away our water by the millions of gallons per day. The deal arranged for by Republicans needs to be eliminated and replaced by a renegotiated contract calling for not only a substantial increased payment to the state for our water but restrictions of yearly quantity and a new program that decreases or eliminates their pulling up salinity into the shallower ground water that people and farms need for everyday use. Is the DEQ still prohibited from updating the Part 4 (Water Quality Standards) Rules? Part 201 (Environmental Remediation) is influenced by Part 4. Schuette received a zero rating (on a scale of 0 to 100) from the Sierra Club, which monitors environmental activities. For a broad and thoughtful background read on this issue, I recommend Dan Egan's recent book: The Death and Life of the Great Lakes. Egan has covered Great Lakes issues for the past 20 years at the Milwaukee Journal Sentinel. Fracking is also contributing to groundwater contamination in Michigan. Just to begin with, we need widespread affordable water testing. There is just no good way for individual households to test their water for the different kinds of contamination, and well water especially needs regular testing.